PORTLAND, Ore.–(BUSINESS WIRE)–Erickson Air-Crane Incorporated (NASDAQ: EAC) (“Erickson Air-Crane” or the “Company”), a leading operator and the manufacturer of the powerful heavy-lift helicopter, the Erickson S-64 Aircrane, today announced that it had entered into a non-binding letter of intent to acquire 14 helicopters and associated personnel and assets from HRT Participacoes em Petroleo, S.A. (“HRT”). The Company will discuss the potential acquisition during its quarterly earnings conference call on November 7, 2012 at 4:30 p.m. ET. A live webcast of the call can be accessed at investors.ericksonaircrane.com or at www.viavid.com in the events section. To access the call, dial toll-free 1-888-401-4668 or 1-719-325-2458 (international). The passcode is 5403949. Erickson Air-Crane specializes in the operation and manufacture of the Erickson S-64 Aircrane (the “Aircrane”), a versatile and powerful heavy-lift helicopter. 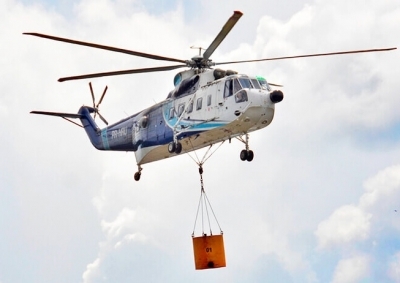 The Aircrane has a lift capacity of up to 25,000 pounds and is the only commercial aircraft built specifically as a flying crane without a fuselage for internal loads. The Aircrane is also the only commercial heavy-lift helicopter with a rear load-facing cockpit, combining an unobstructed view and complete aircraft control for precision lift and load placement capabilities. Erickson Air-Crane owns and operates a fleet of 18 Aircranes, which are used to support a wide variety of government and commercial customers worldwide across a broad range of aerial services, including firefighting, timber harvesting, infrastructure construction, and crewing. Erickson Air-Crane also manufactures Aircranes and related components for sale to government and commercial customers and provides aftermarket support and maintenance, repair, and overhaul services for the Aircrane and other aircraft. Founded in 1971, Erickson Air-Crane is headquartered in Portland, Oregon with its principal manufacturing facility based in Central Point, Oregon. For more information, please visit http://www.ericksonaircrane.com. This press release contains forward-looking statements that are subject to substantial risks and uncertainties that could cause actual performance or results to differ materially from those expressed in or suggested by the forward-looking statements. You can identify forward-looking statements by words such as “believe,” “may,” “estimate,” “continue,” “anticipate,” “intend,” “plan,” “expect,” “predict,” “potential,” or the negative of these terms or other comparable terminology. These forward-looking statements are based on management’s current expectations but they involve a number of risks and uncertainties. Actual results and the timing of events could differ materially from those anticipated in the forward-looking statements as a result of risks and uncertainties, which include the possibility that we do not complete the acquisition of Air Amazonia; our ability to successfully enter new markets and manage international expansion; our ability to realize the benefits of Air Amazonia acquisition on a timely basis or at all; our ability to combine our businesses and the Air Amazonia successfully or in a timely and cost-efficient manner; failure to obtain any required financing on favorable terms; the degree of business disruption relating to Air Amazonia acquisition; our ability to successfully develop Air Amazonia’s existing business and expand into new customers and markets; regulatory or other changes affecting Air Amazonia’s business; the impact of changes in the value of foreign currencies; the risks of doing business in developing countries, and politically or economically volatile areas; changes in economic and market conditions; acts and effects of war and terrorism; lower demand for fleet use; and other risks and uncertainties more fully described under the heading “Risk Factors” in the Company’s most recently filed Quarterly Report on Form 10-Q as well as the other reports Erickson Air-Crane has filed with the SEC. You should not place undue reliance on any forward-looking statements. Erickson Air-Crane assumes no obligation to update forward-looking statements to reflect actual results, changes in assumptions, or changes in other factors affecting forward-looking information, except to the extent required by applicable laws.